Dunlop K180 is a specially designed off-road tyre which can effectively meet the hard-hitting tracks. 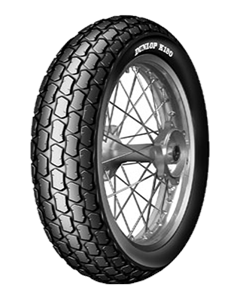 Manufactured to be used in Super Twins dirt track competitions, this Dunlop is categorised under dirt track tyre. The tread pattern featuring independent tread blocks evacuates mud and dirt efficiently for outstanding off-road driving experience. This DOT approved tyre with full dirt track pattern creates good contact with the surface. The advanced tread compound enhances the tread life which paves way to be driven on rugged roads. With solid sidewalls, this Dunlop prevents external damages and assures lateral stability. The special profile design helps in gaining more gripped performance with much reduced noise.